The beautiful Love Bridge collection by Thomas Sabo symbolizes the special and unbreakable bond between two souls whether they are lovers, best friends or family. This fabulous bracelet is made with a string of matt black obsidian beads with a 925 Sterling Silver bar. Two dazzling falcon heads with black cubic zirconia and onyx frame this bracelet for a cool Rebel look. 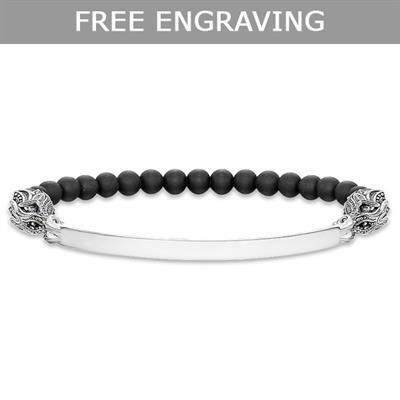 The chunky black and silver combination of this Thomas Sabo bracelet is great for both ladies and gents and is ideal for stacking with other bracelets. All Thomas Sabo Love Bridge bracelets can be engraved.